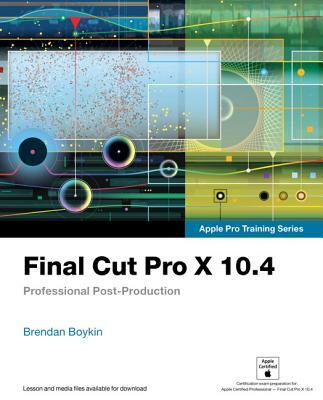 This fully updated Apple-certified guide presents a real-world workflow from raw media to finished project to demonstrate the features of Final Cut Pro X 10.4 and the practical techniques you will use in editing projects. Using professionally acquired media, you'll utilize the same tools and editing techniques used by editors worldwide in this revolutionary editing software. Renowned editor and master trainer Brendan Boykin starts with basic video editing techniques and takes you all the way through Final Cut Pro's powerful features. The lessons start as real world as it gets--with an empty application. After downloading the media files, you will be guided through creating a project from scratch to finished draft. The basic workflow and tools are covered in Lessons 1 through 4 where you create a rough cut. The real-world workflow continues through the remaining lessons as you take the basic project and enhance it with a dive into more robust features including the newest Final Cut Pro X 10.4 tools for 360 editing, precision color grading, and more. - Downloadable lesson and media files to work sequentially through exercises for hours of hands-on training. - Focused lessons teach concepts and take students step by step through professional, real-world editing scenarios to create a final project. - Chapter review questions summarize what students learn to prepare them for the Apple certification exam. - Web Edition provides full text of the book available online with revised content for significant software updates. The Apple Pro Training Series is both a self-paced learning tool and the official curriculum of the Apple Training and Certification program. Upon completing the course material in this guide, you can become Apple Certified by passing the certification exam at an Apple Authorized Training Center. To find an Apple Authorized Training Center near you, please visit training.apple.com.